Note: Kicking the Seat isn’t just a movie review blog; it’s also a place where I can share cool, movie-related things that happen to me. Take, for instance, the following letter, which I received yesterday via Certified Mail. It’s a response to a blind query I sent to the MPAA recently, after having watched Cloudy with a Chance of Meatballs. To my amazement, the suits in Hollywood actually listened to me and now…well, just read and see for yourself. If you’ve ever wondered whether or not letter writing can change anything, allow me to make a believer out of you. Thank you for your very passionate letter regarding Cloudy with a Chance of Meatballs. I’m writing to inform you that the MPAA has just announced plans for the new “GA” rating. Set to debut next year, this new rating will let adult audience members know that the movie they are about to watch will engage them on either an intellectual or emotional level (preferably both). It will also help them to discern which films are worth seeing in a movie theatre, and which ones can be saved for Netflix—where they can pause and resume them at will, or be occupied elsewhere altogether. A key aspect of GA-rated movies will be strict enforcement of standards for celebrity voice actors. Any performer deemed distractingly recognizable to adults—except in instances where their on-screen avatar is supposed to represent the actual actor—will be banned from earning an “easy” paycheck in "GA" pictures. 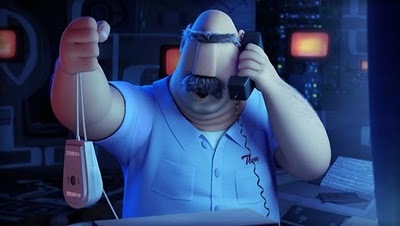 Your criticism of Meatballs’ Mr. Lockwood character actually inspired the corresponding “Gandolfini/Caan Sub-Policy”, which states that no celebrity can do voice work that is too similar to that of another celebrity (Monsters, Inc. drew similar complaints in 2002 when people confused Billy Crystal’s voice with that of Nathan Lane). The “G” rating will still be in place, and will denote fare suitable only for children. You’ll be happy to know that 3-D films will not carry the “GA” rating, as our board has found the major studios incapable of using 3-D technology in children’s films in ways that do not involve characters or objects running at the screen for no reason other than to stimulate the basest regions of the mind. While moderately effective in theatres that support the 3-D technology, our studies have found the 2-D home viewing experience to be frustrating and annoying for adults. In closing, I’d like to apologize for your disappointment in Cloudy with a Chance of Meatballs. Your remarks about wishing that you were eight years old so that you could find it amusing struck a chord with everyone here at Ratings. I hope that the "GA" standard will spare you another ninety minutes of grueling boredom. Thank you again for your concern, and have a nice day.